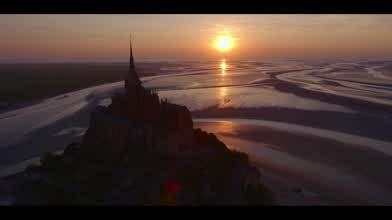 Mont St. Michel is an island off the coast of northwestern France. It is situated near the mouth of the Couesnon River, which forms the border between Normandy and Brittany. The monastery which dominates the island, built in the 8th century, is one of the most widely recognized historical sites in the world and a UNESCO World Heritage site. Contributor Freeway Prod, one of France's the top drone piloting firms, treats us to an aerial tour of this magnificent place.